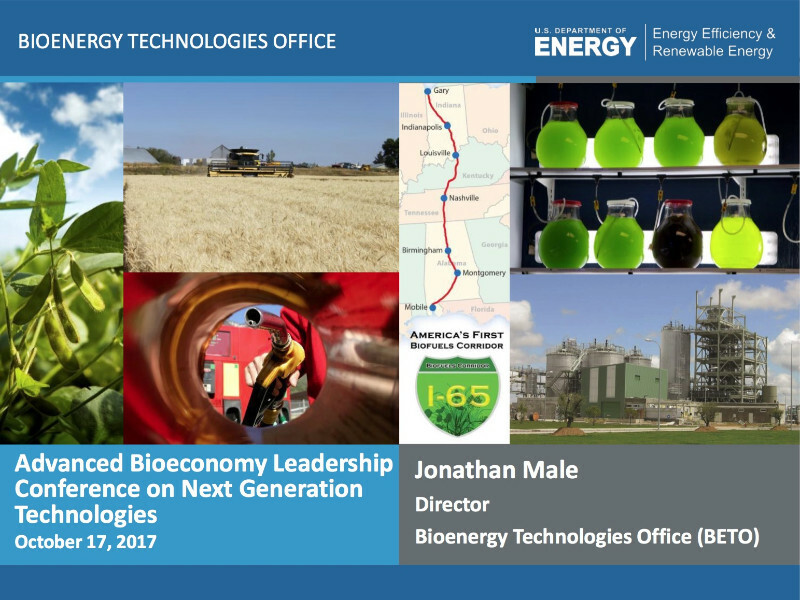 The U.S. Department of Energy’s Bioenergy Technologies Office (establishes partnerships with key public and private stakeholders to develop technologies for producing cost-competitive advanced biofuels from non-food biomass resources, including cellulosic biomass, algae, and wet waste (e.g., biosolids). BETO works with a broad spectrum of government, industrial, academic, agricultural, and nonprofit partners across the United States to develop commercially viable, high-performance biofuels, bioproducts, and biopower made from renewable U.S. biomass resources that reduce our dependence on imported oil while enhancing energy security. What’s the latest? BETO Director Jonathan Male answered the question in this update, given at ABLC Next 2017 in San Francisco. In this deck, he looks at milestones ahead, programs, goals and challenges.